Muvezi’s Shona artists produce among the best quality and most unique African designs on the market today. Muvezi has a vast array of fair-trade, decorative stone designs. Their elaborate Shona collection extends from tribal and wildlife art to exquisite garden gifts and outdoor sculptures. Designs range from elaborate angels and gargoyle statues, to gnome sculptures and fairy fountains. 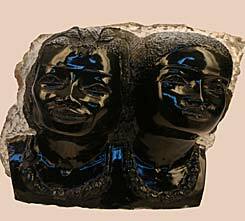 Shona stone sculpture is a highly esteemed and traditional fine African art form. The magnificent decorative stone and tribal art pieces, produced by the Shona people of Zimbabwe, are on display at galleries and museums around the world. 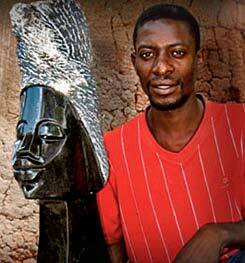 Muvezi’s Shona sculptors produce art for the home or office. They can be used as gifts or bought for charity. Sizes range from life-sized lawn and garden statues, to smaller outdoor fountains and mantel-sized abstract pieces. Muvezi’s artists have been individually picked among thousands for their high-quality craftsmanship. The sculptors receive weekly shipments, directly from the mines ,of the best stone available in Zimbabwe. The materials arrive directly to their studios where they can work undisturbed and stress-free with their apprentices. Muvezi sells directly to the buyer, eliminating the middleman and keeping prices down. This not only ensures supreme quality in each and every decorative stone piece, but it allows Shona artists to keep a greater proportion of the income. Muvezi’s fine Shona art make the perfect charity gift or unique office piece. They are also ideal for beautiful indoor or outdoor sculptures, spectacular garden fountains and magnificent life-sized statues. The evolution of Shona sculptures from traditional stone art to a modernized pure fine art form dates to the 1950s. A Mexico-born, English art historian and critic named Frank McEwen, who was also a confidant of Picasso, Matisse and Miro, introduced the contemporary idea of Shona sculpting into Zimbabwe. He worked at the country’s first national gallery, in the capital city Harare. McEwen was interested in how traditionally trained sculptors could carve modern forms using ‘primitive’ sculpting techniques. He encouraged young painters and sculptors to trust their talents and “let the spirit of the stone release”. As McEwen himself explained, “each work of art is an expression of the artist’s individual creativity”. Shona sculptures are based on the myths of the Shona tribe, who as an ethnic group date back to the 14th century. The artists, traditionally and still today, rely on deeply held spiritual beliefs, folklore and daily life rituals for unleashing creative inspiration. The most fundamental belief of the Shona people concerns the relationship between the visible physical world and the invisible spiritual world of their ancestors. Common themes include wildlife, family, nature, daily life activities and metamorphosis. There has been a rapid rise in international recognition over the last 50 years in no small part due to McEwan’s help and the relentless determination of Shona sculptors to revitalize their traditional art form. Today, Shona stone art is entering its third generation of sculptors. This group is the most experimental in changing form and configuration. It is also the most open to freedom of expression and playing with the artists’ individual creativity. Muvezi’s artists have been individually selected for their superior sculpting talents and creative ingenuity. All Muvezi’s Shona sculptures are produced using the highest grade stone available. This ensures both the artist and buyer receives only the best fine art tools available. MUVEZI gallery and MUVEZI charitable foundation working for the ground up, MUVEZI has built a bridge of hope and prosperity, from art and for health.